The 4th of November is armistice day in Italy, and this is why a new exbition is opened today until the 6th of January at Vittoriano, Rome. The collection of more than 200 documents is intended to be the first step of a three event path leading to 2014, the year when all countries are officially starting the celebrations. The visitors will go through a layout that is shaped with several kinds of documents: postcards, trench newspapers, diaries, letters, postcards, films, books, carvings, paintings, etc. The curators are Romano Ugolini, president of Institute of History of Italian Risorgimento and Marco Pizzo, vice director of Museo Centrale del Risorgimento di Roma. The layout concept takes its cue from the general idea that will inspire all the First World War Centenary celebrations in Italy: the Italian population as the central point, not only during the war years but also before and after. This is what assures also Paolo Peluffo, the president of the Committee for Commemmoration. 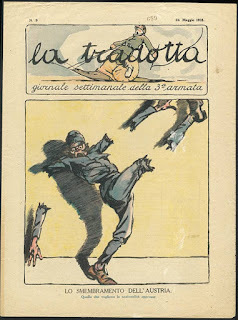 The different sections of the exhibition develop from the crisis of the late Nineteenth Century, the so called "Giolitti's age", the Italian industrial revolution and the colonial parenthesis, the roles of the predominant social groups (the Catholics on one side and the Socialists on the other) and do not forget to contemplate a prominent figure like Gabriele D'Annunzio and his peculiar position in this scenario, both from a political and from a literary point of view.